This is a FIVE-part blog post to show you how you can change your life significantly by taking over an established business without spending any of your own money, before dramatically improving it then selling it on, sometimes as quickly as three months for the maximum profit. This will make you a business trader. It’s like flipping real estate but much more fun and much more profitable. 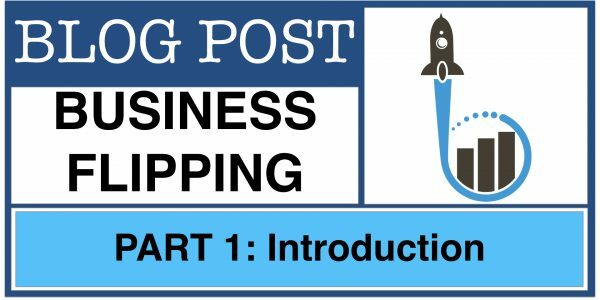 Part one of this series will give you an introduction to the process and how we will be filling in the gaps in posts two, three, four and five. However, you may just want to hold onto the business for 12, 24 months or even longer. You may want to use your new-found business deal making skills to bolt other businesses onto your first, thus turbocharging growth and profits and further maximizing the value of your expanding group of businesses when you do want to sell. I will also show you how you can systemize the business so that it runs without you, allowing you to benefit from the cash the business generates but allowing you a better work/life balance to do the other things in your life that you cherish: spending time with your family, hobbies, vacations, travel, and so on. In part two of this blog series, we will start looking at the cash-free acquisition process. What do you ideally need to look for in your first business? The reasons for you to go down this path? Why finding your dream business to acquire is a mix of your passion and business experiences so far. In part three, we will get into the 10-step process of acquiring a quality business, between $1 million and $20 million in sales revenues, cash-free. How to originate many opportunities to evaluate and how you select the chosen few to pursue to completion. We will also look at how to negotiate a no-cash down acquisition and how this can be done to create a win-win between you and the seller. In part four of this blog series, we will then look at what happens once you own the business. How can you quickly and dramatically add significant value to the business so that you start to increase its value from the very first day? We will discuss how you can systemize the business to run without you and identifying your key insider person to perform all the day-to-day functions. That person will be working in the business, allowing you to work on the business and act strategically rather than tactically. I will share my 7P framework with you, developed over my 23 year career interacting with 1,000s of small businesses. We will also look at some immediate sales, marketing and profit boosters so the business development engine is fuelling growth, further maximizing the profitability on a daily basis and the increased profit you will make when you decide to cash in on the business’ success: short, medium or long term. In the final part, we will look at the exit strategy. Why do some companies pay many times more than others? Why do larger businesses buy smaller businesses and how can we find the strategic trade buyers who will pay us the very top dollar for what we have built, either short term or long term. We will also look at using the same rationale for you to bolt on other businesses, to make your business even more valuable. How can you generate operational synergies, cross selling and upselling opportunities to justify the 1+1 = 3 scenario. The only difference being you will continue to bolt on additional businesses (if you so choose) for no money down, whereas we will be selling your business (if you want to sell) for the maximum amount possible. That’s it for this introductory start to this five-part blog series. In part two, we will explore the concept of acquiring your first no-cash down deal and the 10 things your first business needs to have to set you up properly.